I’ve spoken about ERS Game Studios before and how easily they slip under the radar. They make a lot of HOPA, some of their franchises quite iconic, but except for one or two of their games I never really get stuck in with them. Sure, I liked Song of the Phoenix but even then it was more of an accident that I liked it than it was good design. So, let’s talk about the next title in the Spirits of Mystery! When you wake up one morning, your nanny has some grave news for you: all your magical animals have been stolen. You’ve cared for those animals since you were just a small child and they are your friends, there’s no way you’ll let someone steal away with them in the night. So you quickly set off after them and it doesn’t take long for you to pick up a trail. A trail that leads straight into evil and you’re the only one who can stop their nefarious plans to raise the Dark Minotaur. That’s about what I can remember of the plot and considering I just finished the game a few days ago, that’s impressive. 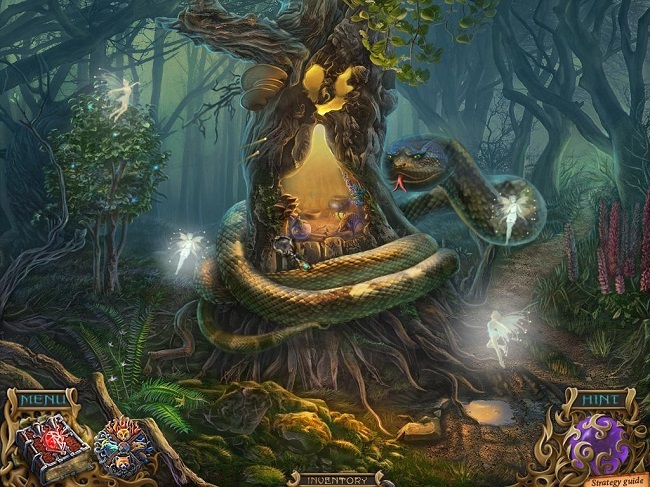 To call the entire story standard fare for a fantasy HOPA is to put it mildly. Putting it harshly would be saying it’s trite, dull and less of a story and more of an excuse. Going after some magical animals only to get wrapped up in a plot to resurrect some evil power is the height of coincidence not to mention anything about how uninteresting it actually is. I mean, a princess going after her possessions? I know they make it out to be like the animals are her friends but they never actually interact as friends. All they do is give her items when she feeds them. Doesn’t really seem like love to me, more extortion: give me items or no food for you! Maybe I’m being overly harsh with the princess but it’s one of the most consistent thoughts I had throughout the game. That she was only there because the villain was so inept that he was more or less caught right away. And she only remained in the way because the villains kept making bad choices, like not killing her right away. She’s not even important to the story, she’s not special, she’s just a spoiled kid who wants her animals back. The villain’s plans don’t require her for anything so how she’s not removed the first chance they had is beyond me. I get that there’s only so many times you can write a story about a magical and special princess before you lose your mind but I’ll take that over a story where she’s entirely secondary to the story. 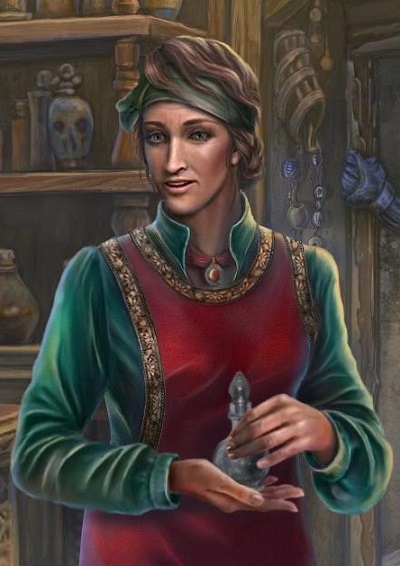 The store keeper that pops up from time to time has more urgency to bring their evil plans to an end so why aren’t we playing as her? At least she has some personality. And speaking of the store clerk, the game’s sole addition in an attempt to innovate is that the player turns invisible from time to time. You’d think that would be a bigger thing than it is but it’s really just a solution to three different puzzles followed by a time where you’re invisible but nothing is ever made of it. You get this potion from the store clerk and the first and second time as a natural progression but the third time it actually took me some time to figure out that I had to backtrack to the store clerk to get the potion. Both times before there was always a “quest” associated with it, some item I had to bring but this time it was just a matter of going back a last time. And… that’s not okay. So much in this game makes no sense and I’m not talking about the plot. Solutions rarely come naturally and there were plenty of times where I was stumped and couldn’t progress without trying items randomly. Now, part of that problem is on me because I chose to play the game on the hardest difficulty where they don’t spell things out for you. In many HOPAs, when you click on something, you get a bit of flavor text describing the item in question, whether it’s relevant to the gameplay and what you have to do to it to progress. “This shelf lined with books is incomplete. I have to return the three missing books.” is an example I just willed up but it’s real enough that I totally believe I could’ve seen it in game somewhere. And I hate them. They give away the solution far too easily and I never have to think. So when I saw the option to turn off these so called “black bar hints” I was all for it ’cause I figured I’d be in for a real treat with vague and obscure flavor text that only described the object, not the solution. This is something I would like to see from other developers down the line. This game is fairly old for a HOPA (I don’t think Eipix was even making games when this was released) so maybe it’s already changed. But what I didn’t expect from the game was that it turned off the black bar virtually entirely except for some canned dialog when you do something wrong. And in a fantasy game that’s a bit of an issue because half the time the objects you’re looking at are a mess of parts or they have no real equivalent so you’re kind of at the mercy of the game to tell you. And guess how this game delivers all of its descriptions? That’s right, through black bar hints. So what do you get? A game entirely devoid of descriptions. Now, I could go into detail about how stupid this is and point out that hints and descriptions are, or at least should not be, the same thing. So if you’re gonna play this game, for the love of all that is dear to you, do not play on the hardest difficulty. The middle difficulty should do just fine. Speaking of something else entirely and perhaps somewhat more positive, the graphics are okay. I’m not super fond of the design in general, the colors are very muted and there’s a lazy feel over all of it. 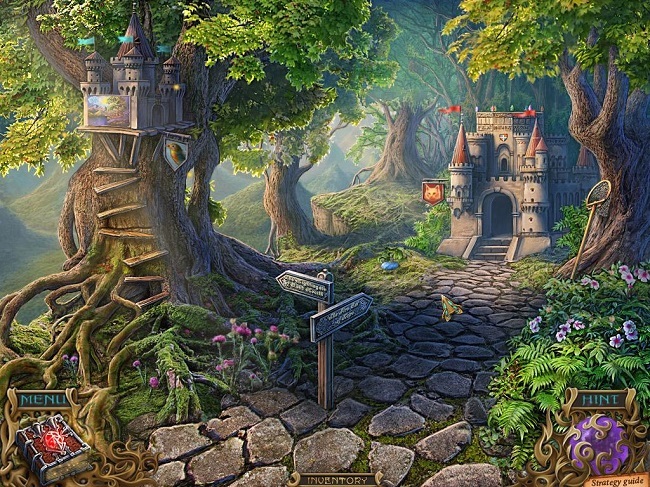 It’s a fantasy game that never really aspires to much more and I find that very tedious. Nothing really stands and I fail to remember anything wildly unique. But I won’t say it’s bad, just safe… and perhaps that’s where ERS prefer to be, I don’t know. All I know is, I don’t like. 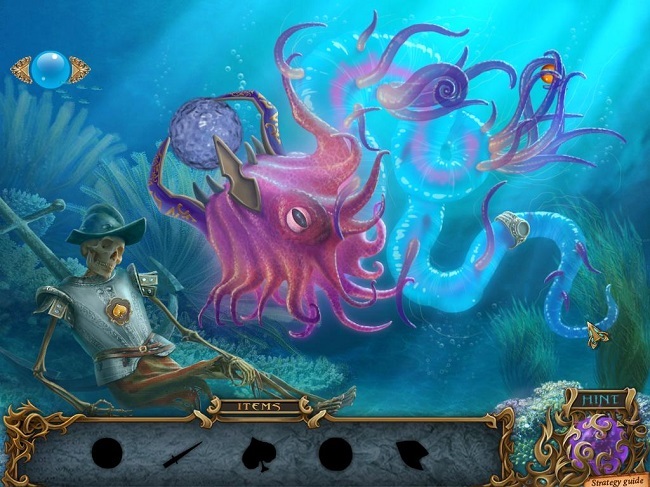 To no-one who read my blog’s surprise, the muted colors really hurt the game in my opinion as I expect fantasy HOPA to be colorful and vibrant. It’s what makes them fun to me. That’s not to say that I wouldn’t mind a dark fantasy HOPA with serious themes but that’s not this game, it’s whimsical story about magical animal friends and their princess that happen to get embroiled in the resurrection of a big evil that goes nowhere. In other words, the game doesn’t earn its claim to darkness and the graphics simply clash with the story it’s trying to tell. And it commits a cardinal sin by being in 4:3 resolution, meaning not widescreen, something that by 2012 (late 2012 even) should’ve been a thing of the past. The previous game in the series was also in 4:3 resolution so it’ll be interesting to see when they decided to join the modern world and stop forcing me to lower the resolution on my TV so I can play it (it won’t start otherwise). but the graphics are still quite good even if it stumbles in some areas. But it feels overwhelmingly outdated for even a HOPA from 2012, a time when other studios were publishing far more impressive stuff. 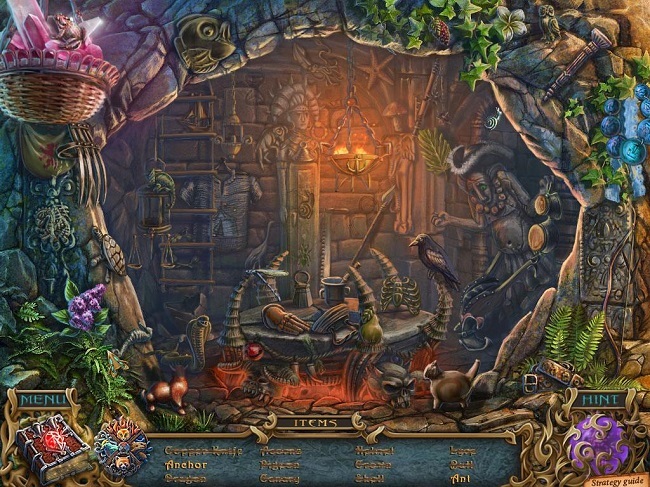 Hell, Mystery Case Files: Shadow Lake was released in November 2012 and that franchise has had widescreen support for years. Now, not everyone can be Big Fish Games (sadly now defunct) or other similar studios but ERS has never struck me as a small publisher so the money must’ve been there. 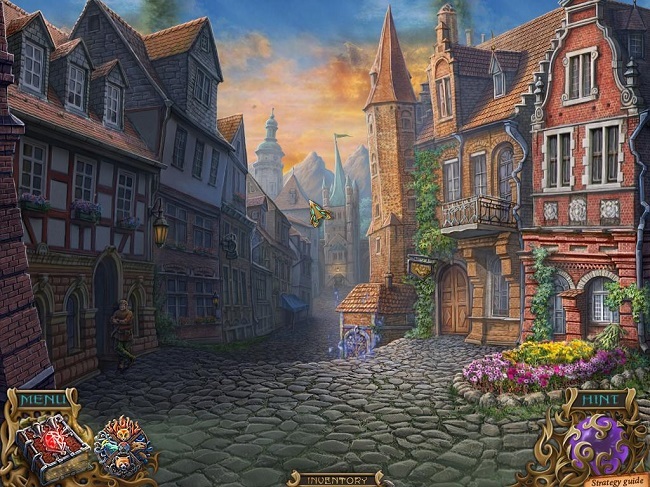 Another aspect that fully adequate but still a bit disappointing was the hidden object scenes. 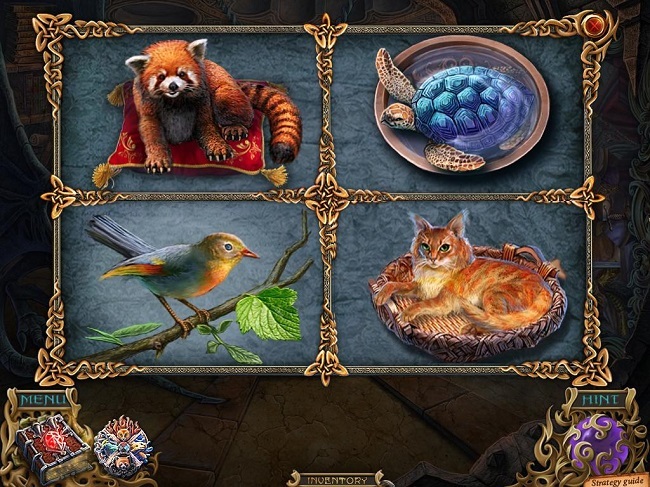 Though not solely list-based, they were by far the most common and the only other type of hidden object scene were what I call “story book” scenes where you have to find an object on the screen and place it where it belongs for the story to progress. Well, without the story this time. But even they were kind of meh and there were only like… three or something so lists were still the overwhelming majority. They were fairly challenging, though, but sometimes for the entirely wrong reasons and the interactivity in the scenes was sparse at the best of times. The story book scenes were far more interactive but it lacked strong visual clues as to where the first couple of items were hidden. Once you found the first item(s) it was typically quite easy as it was a chain of events after that but finding the first one could be quite tedious as they often required interaction to be revealed but they were poorly indicated and you often ended up just… dragging the cursor around hoping for it to change, indicating interactivity and that’s not how I want to beat these things. The only thing that made them somewhat unique was that you had two screens to each story book scene and the objects you found could go in either two. But it was rarely difficult to figure out which one it went in and it would’ve been a better bet to maybe have three screens, even, to up the challenge a bit more. That said, they often sported a ton of color which always pleases me so I’ll give them credit for that without a doubt. I just wish it bled into the rest of the game more. That said, there were some locations that I really enjoyed and every so often the game would surprise me with a really awesome design, like the featured picture at the top of the page. I just wish there was more of it and that the designs that were cool carried more importance than just being cool. Again, referring to the featured pictured, I was honestly quite excited when I first saw that because I thought I’d actually see those creatures at some point in the game. But alas that was not meant to be as it was just a relatively simple puzzle and then nothing more. Hell, I could write a whole franchise starring those six as the baddies so I’m quite disappointed they didn’t even warrant a cameo in this game. 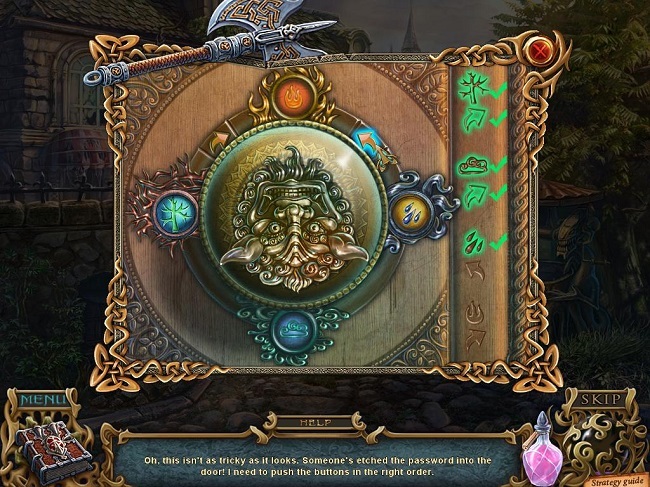 As for the puzzles (this is a HOPA after all), they were quite easy in general and te ones that might’ve offered a bit of a challenge often had the answer revealed on the puzzle (like the picture above). I have very little patience for this stuff as it reduces the puzzles to a glorified lock and not actual gameplay. And while you could turn of black bar hints, there’s no such option for the blatant answers on the puzzles. So while one section of the game was entirely removed, another was far too easy. That sums up the entire game for me. For everything good, there’s something negative. Well, except for the music, there’s just no excuse for the music. It’s alright but there’s very few tunes and they seem to be on an endless loop. So the music would drive you insane whenever you got stuck and you eventually heard the same song over and over again. And the hint system is completely useless, the kind that only tells you if there’s anything to do in the immediate area and if there isn’t then it just pathetically holds up its hand and goes “I got nothing, press me in another area of the game?” or something to that effect. I hate that system, it’s never been good in any game. So maybe the game does come in under the bar, mediocre but leaning towards bad. And I really don’t recommend it. While I enjoyed Song of the Phoenix, this game does nothing to pull me into the world at all. I don’t know how the rest of the franchise stacks up but this felt like filler, there because they had to have something and couldn’t come up with anything else. Like I said, I don’t recommend it and it’s not because it might be bad but because it’s entirely forgettable. It’s mediocre fodder for the masses that I sincerely doubt anyone remembers today, four years later. So why review it? Well, because I can’t just talk about good or bad games, there is middle ground and that’s important to note. Cause otherwise it’s easy to get stuck in extremes and not appreciate nuances. If this review seemed… meh… then it’s only because the game itself inspired so little to actually get upset or elated about. I promise, next review is going to be a little bit more modern. I know that what I am posting here is entirely unrelated to this. But I really need to get this off my chest. It’s about that review of Power Rangers Megaforce that you put up. I don’t like it. I don’t mean to offend you or anything. But reading that review has really frustrated me… a lot. There are so many, so many glaring problems with Megaforce. When you said that you liked the show “flaws and all”, were you only referring to just the flaws of Megaforce that you specifically mentioned in your review? Because you have’ even come CLOSE to just what hell is wrong with the first half of this god-awful series! All that you criticized about Megaforce was Emma, the ‘Harmony and Dizchord’ episode, and Robo Knight’s character development being rushed. Oh! And speaking of rushed, EVERYTHING IN MEGAFORCE IS RUSHED! Gosei just keeps handing out new Zords and Power-ups to the Rangers, who didn’t even earn them every! F**king! Episode! What is the point of introducing all of these new things if they’re not going to be used that often?! There is little to no build-up for anything! The rivalry between Troy and Creepox was only two episodes! TWO! Most of the villains in Megaforce get killed off without really doing anything of real importance, or having any character development. There is hardly anything that gets into a status quo! There is no thought or planning put into whatever gets adapted from Goseiger or Gokaiger! Everything is so lazily copy-and-pasted. What’s even worse is that everthing from the Sentai it adapts is badly watered down, is not explained to make any sense of the plot, or makes little changes to the plot that make even less sense. The Mutants’ origins and motivations are so contradictory and hypocritical, Vrak uses “telepathy” as a thrown together excuse to make his plan sound more credible in ‘Ultra Power’, Metal Alice decides to run a test on friendship that comes out of left field in ‘Rico The Robot’ (it made sense in Goseiger. But not with Megaforce), and Vrak decides to waste even more time to derail a few measly trains (Trains are very efficient and heavily relied upon in Japan, not nearly as much here). I can understand that not everything from Sentai is going to adapted for a season of Power Rangers. But the people in charge of Megaforce could have done SO MUCH more with what they had. They needlessly skipped over so many monsters and Megazord fights that could have easily been adapted for our version! Even with the timeframe this show had, it really could have done way better, and still tell a good story. But it didn’t because the show was too lazy and uncreated to micromanage it’s running length, and just padded out everything in ways that were not very productive. It’s very hard to compress a whole Sentai into just around 20 episodes. But with proper planning and a more qualified staff of talented writers and editors, it is doable. I could go on and on about what is wrong everything else that is wrong with Megaforce, but you should watch Linkara’s review of Megaforce because I don’t want to be stuck here writing this all day. Please, watch his review, and you will understand better just why many people consider both Seasons of Megaforce as the absolute WORST that Power Rangers has ever gotten. Hi! I like you because you read my stuff, haha. You even commented and I’ve only got like… three comments my whole time writing on this thing. So thank you for that even if you didn’t particularly like my review of Power Rangers Megaforce. In the future, feel free to comment on the review itself, though, I do still get an update if you do so I’d respond either way. If I ever do another one, that is. First I’d like to point out that I haven’t seen Linkara’s review since I haven’t seen Super Megaforce yet. As such all my review covers is the first season, as it were. Not sure if that was clear or not, just pointing it out in case there was a misunderstanding. Now, I hate to come off as dismissive but I don’t take Power Rangers very seriously. Linkara does that well enough as is and my focus is entirely on Super Sentai (or rather tokusatsu) so I’m the reverse Linkara here, haha. As such my interest in Power Rangers is in the here and now, how much I enjoyed it while watching and I don’t dissect it to the degree that I do tokusatsu or how Linkara analyzes Power Rangers. Perhaps I gave the impression that I followed Power Rangers for a long time when I really only saw a bit after Mighty Morphin’ as a kid and as an adult I watched up to Wild Force (which I utterly detested) before calling it quits. So Megaforce was a return for me and much of my love for it is tied to my nostalgic love for MMPR. The cheesy acting, the “better than real” teenagers reminded me of how they were back in MMPR as well as the theme song and the colors and so forth. Plus, it was a short season so I didn’t really have 40+ episodes to steam about various issues. And again, I don’t take it as seriously as I do tokusatsu, I just watch to have fun and comment on what I remember and what I liked then or didn’t like then (like my dislike for Emma which is with me to this day). It’s entirely possible my opinion would be very different if I had watched both seasons back to back but to this day I have not yet seen Super Megaforce so there’s that. That said, I agree with a lot that you said. That they even decided to adapt Goseiger is a mystery to me instead of going for Gokaiger right away and making it an epic return with a new team taught by the old members. And make it a full season instead of what they did here. And I don’t remember individual episodes well enough to comment on the quality of them and I forgot them pretty quickly so you’re no doubt right that a lot of episodes don’t make sense (but in fairness that’s how a lot of MMPR was as well). But again, my intention is not to analyze Power Rangers in any depth. Linkara does that already and does it very well and for me it’s more of a fun thing, comparing how the Power Rangers series holds up to the Super Sentai original, which is what I care about. Granted, I haven’t returned to this since I wrote this and that was a long while ago so maybe I should get around to it, god knows I’ve been lazy enough lately. Anyway, thank you for your comment, whether you agree or disagree with my text, I always appreciate a comment and I love discussing these things so feel free to comment again no matter the subject. I’ll get around to watching Super Megaforce soon and maybe then my opinion will change and I’ll be able to give it a deeper comment. Well, thank you for understanding at least. No worries! I do hope this hasn’t put you off reading my stuff entirely and hopefully I’ll get around to watching Super Megaforce before the end of the year and I’ll post a review of that too. Maybe I’ll give you more of a cause to be angry with me. 😉 Stay safe!